Congresswoman: Taxpayers deserve a tax code that is simpler, flatter and fairer. The House’s tax reform plan does that. Families today are working more but can afford less. Throughout the United States, the cost of college, health care and housing have each outpaced wage growth in the past decade. Sixty-three percent of Americans don’t have enough to cover a $500 emergency. When they become parents, they are faced with a new price tag: childcare for only one infant takes up 17.6 percent of a typical family’s income in Arizona, according to the Economic Policy Institute. For years our economy has been stifled by an outdated, broken tax code that is 74,000 pages long and filled with loopholes, handouts and bailouts for special interests. It rewards lawyers and lobbyists — not hardworking families. Sky-high rates penalize the success of main street job creators, driving up the price of goods and services for everyone. Globally high tax rates send jobs overseas, making it harder to find good employment that supports your family. The IRS picks winners and losers. Inefficient federal programs run by Washington bureaucrats take and waste families’ hard-earned dollars. It doesn’t take an economist to see our current tax code is keeping wages stagnant, our economy slow and families living paycheck to paycheck. Taxpayers deserve a tax code that is simpler, flatter and fairer, so that every American family and employer can file their taxes without paying astronomical compliance costs. The Tax Cuts and Jobs Act that the House passed on Thursday with my support will bring historic relief — slashing taxes, closing loopholes, fostering job growth, allowing America to compete and win in a global economy, and putting more money back into your paycheck. While there are many ways to measure how this plan will help Arizonans, the most important metric is how it will impact hard-working families like yours. Washington needs to respect your family by rewarding your hard work and returning your money. These tax cuts will save the typical family of four in Arizona $1,182 every year. How? Our plan simplifies and lowers income tax rates for low and middle-income Americans, nearly doubles the standard deduction, increases tax credits for children, and preserves the mortgage interest and charitable contribution deductions. In fact, a family of four making $55,000 a year will pay no federal taxes at all. What could your family do with those thousands of dollars that Washington used to take? This legislation will help working families overcome the challenges they face in our modern economy, like the burdensome cost of childcare. Sixty-one percent of children under 5 are regularly in childcare, and it often costs more than college. As founder and chairwoman of the Working Group on Women in the 21st Century Workforce, I’ve heard firsthand about this obstacle from working women who are trying to make ends meet, provide for their families and meet their full potential. That’s why I fought hard to ensure that the Child and Dependent Care Tax Credit was restored in the legislation the House drafted — and I won. Now our plan not only protects the child tax credit, but also increases it by 60 percent and includes a new Family Flexibility Credit. Additionally, this legislation supports parents by streamlining higher education benefits so families can save for college and other education expenses. Finally, it preserves and protects critical retirement savings options like tax-free 401(k) plans and Individual Retirement Accounts so that hard workers like you can save for a financially secure future. The Tax Cuts and Jobs Act also helps Arizonans by promoting a healthy economy that has more job opportunities with higher wages and benefits. Take the Ruiz family in Tucson, which specializes in metal distribution and employs five people, but wants to grow. They currently own only one waterjet machine. When it breaks down, their team is forced to work later hours to make up for lost time. The Ruizes’ story is similar to many I’ve heard while hosting roundtables, visiting local businesses and listening to constituents throughout my district. Employers of diverse industries, sizes and cities have all voiced a united theme: taxes are suffocating them, and they need this relief. Small employers currently face tax rates as high as 44.6 percent. The tax code is so complex that businesses spend an estimated $147 billion every year filing tax returns. Our plan will reduce the tax rate for job creators and simplify the tax code so Arizona employers can focus on their customers, take care of their employees and create more jobs. It also allows employers to immediately and fully expense new equipment. This legislation will help hard working families in Arizona make — and keep — more of their hard earned money, and that’s why I voted for it. The last time the tax code was overhauled was 31 years ago. It’s time we give taxpayers and job creators the biggest boost this country has had in a generation. You deserve it. 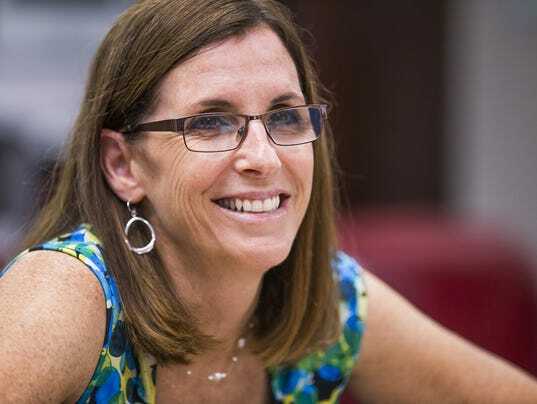 U.S. Rep. Martha McSally, a Republican, represents Congressional District 2 in southeastern Arizona.